One of our best sellers and a fantastic choice for anyone looking for an effective promotional plastic pen. Introducing one of our most popular pens to date! It's no secret why these are so popular, they highlight your branding beautifully, are a good quality pen and come in a wide range of eye-catching colours. 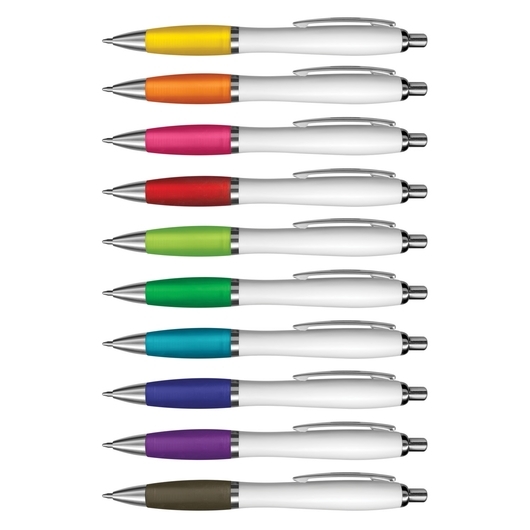 The pens are retractable and made from both plastic and metal with a frosted translucent soft touch rubber lacquered grip and shiny chrome trim. They utilise a tungsten carbide ball for superior writing quality and come with 1800m of black German manufactured Dokumental ink.